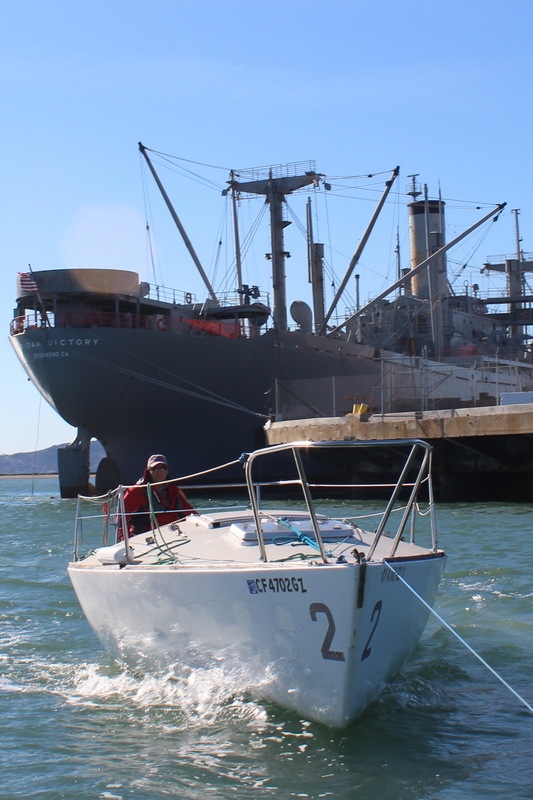 Two volunteers joined forces to help un-step J/24 masts and complete a round-trip to Bay Marine last week. Four shiny white hulls are done with three to go. Bonus enclosure: directions for navigating Clipper Cove at low tide. 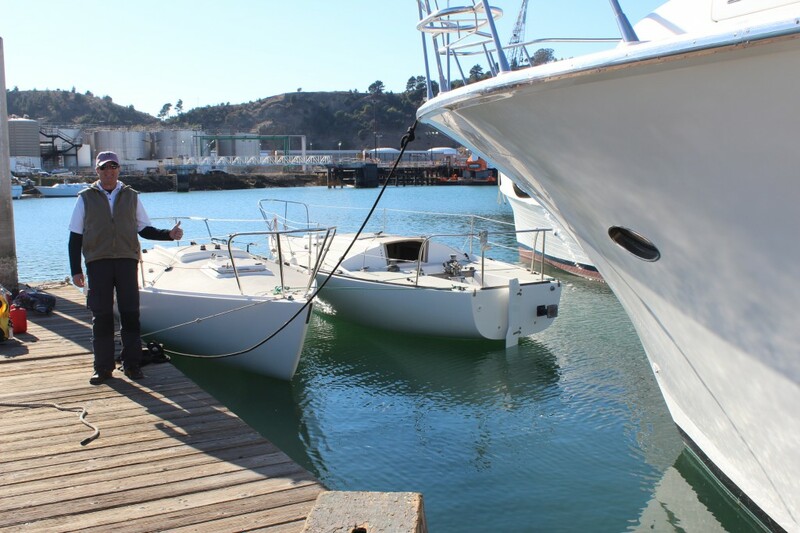 Rajat Dutta, long-time crew on Melges24 “Posse”, donated a morning to prepare Fortunata and Great White for delivery to Bay Marine Boatworks. We’ve been using the small hoist to unstep masts for the J/24 upgrade program; this approach works well and saves time over the traditional use of gin poles. A +6.5 tide helped. A few days later Bill Nork, TISC friend and frequent volunteer, helped with the over-and-back transit from Clipper Cove to Point Richmond; we left on schedule at 11am. Our normal journey of 90 minutes stretched to two hours because of the unusual NE breeze, strong ebb current and missing motor mount on Great White. No complaints for Mother Nature – we had a blue sky day with balmy temperatures for a January morning and the Bay to ourselves. As we passed Red Oak Victory the air felt warmer once out of the cool n’easter on the bay. Beef Cakes and Blue Stripe looked bright, white and ready to go. After a quick motor switch we headed back to TISC. The return trip was much faster; just over 90 minutes from dock to dock thanks to the wind at our back, a boosting current and two motors in operation. 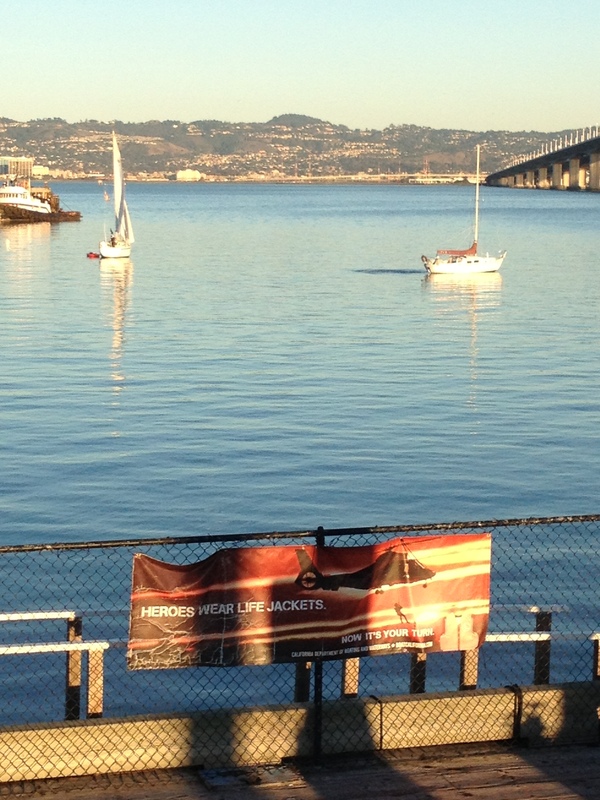 The views of the “new” Beef Cakes and Blue Stripe framed by Golden Gate Bridge and Berkeley Pier led to thoughts of “what next” for the graphics on these bright new hulls -suggestions welcome ! 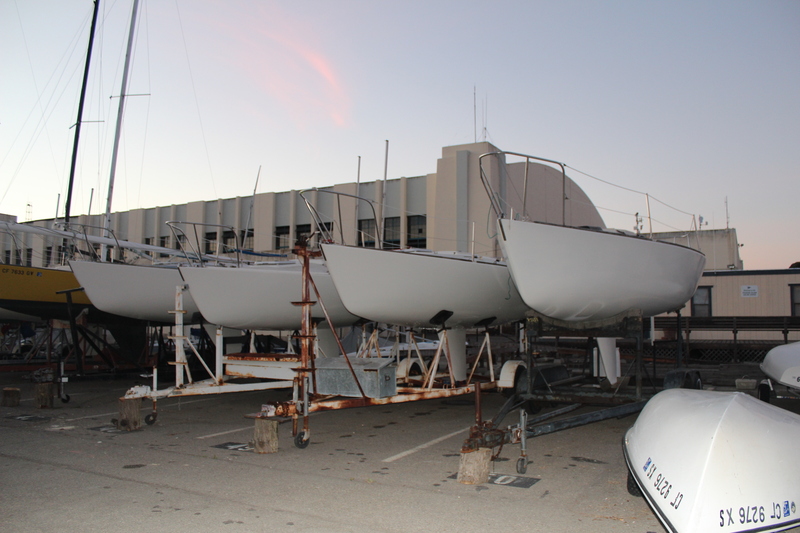 Even with dusk approaching, our four newly painted hulls looked clean and bright. As the sun set on the Western end Clipper Cove the tide lines were clear. There’s only one more transit before our J/24 fleet will have all new bottoms. If you are interested in helping, let me know. Next to providing rides to visitors on opening day and taking pictures of kids smiles, this has to be one of the best volunteer jobs we “offer” to our tenants and friends. 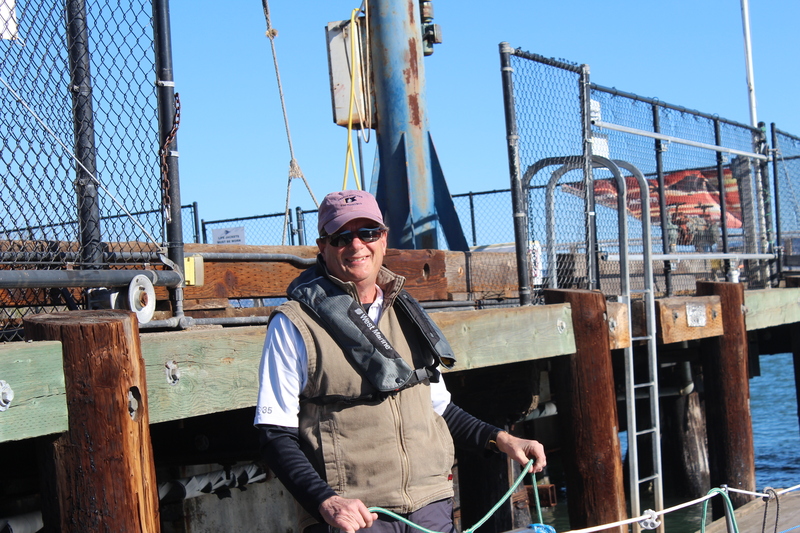 Even with a speedy return trip we rounded Pier 1 later than planned and not much ahead of a -.04 tide. While not the lowest of lows (that would be around -1.6) we did have to be mindful of our entry into Clipper Cove. 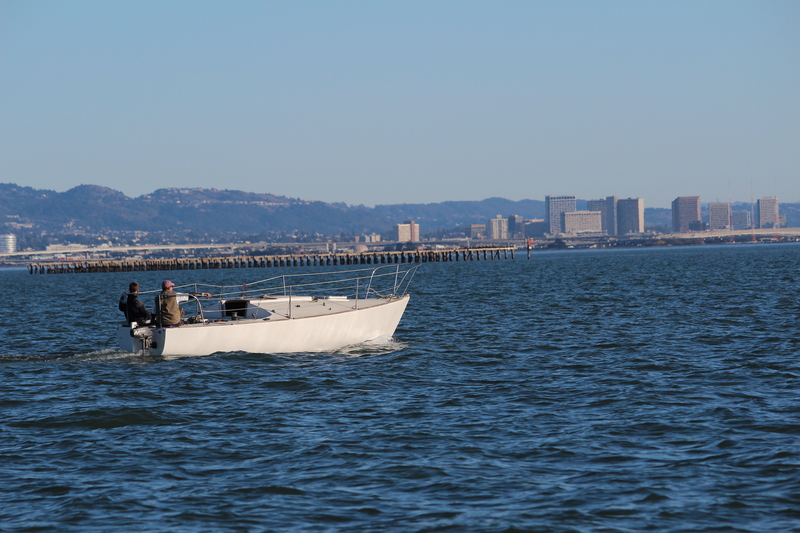 If you’re in a similar returning situation (or trying to get out for a practice session) hug the large pier closely – no farther than 1-2 boat lengths away. Proceed nearly all the way to the rocks bordering TISC and then take a sharp left 3-4 boat lengths from breakwall. This path may not enable a 3′ draft to pass over the sand bar across the entry at tide levels shallower than -.5 to -1.0, however it’s your best bet. 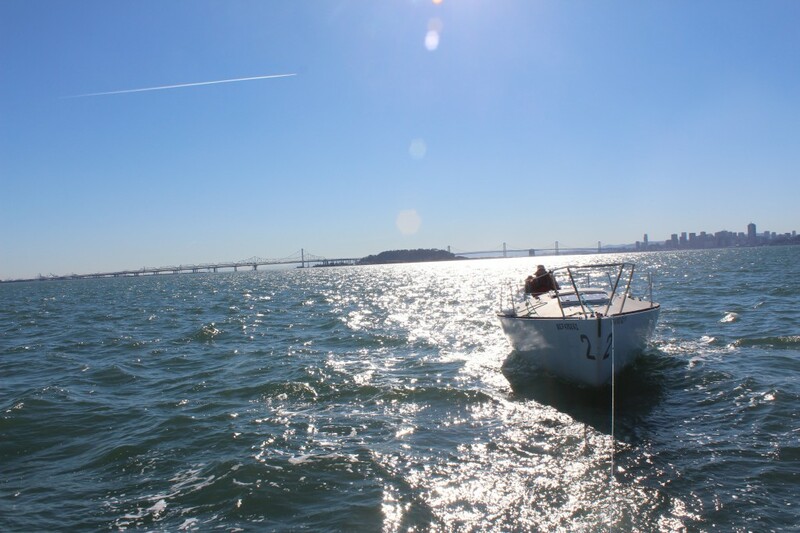 For deeper draft boats, not much choice other than stay away from low-low tides; if you must make a transit during low tide use best efforts to do so on a flooding tide not an ebbing tide. 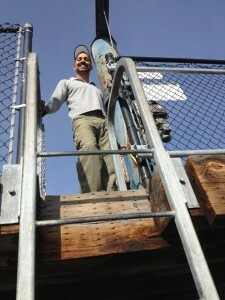 That way if you do get stuck your “down time” will be minimum. The boats shown on the right exiting Clipper Cove as we returned did not make it out until the tide began rising. 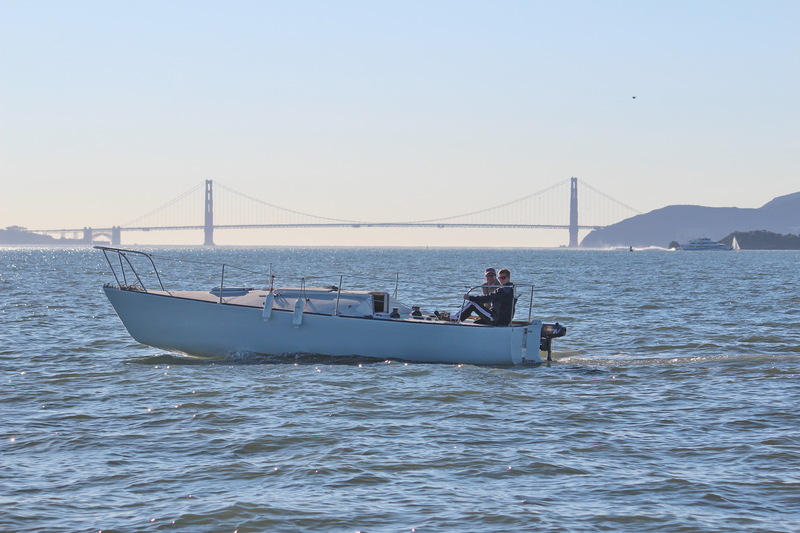 This entry was posted in Uncategorized and tagged Bay Marine Boatworks, Clipper Cove, J/24, non-profit, San Francisco Bay, TISC, Treasure Island Sailing Center by skippersgift. Bookmark the permalink.